106)Why we use token field for Concurrent program? The Token is used as for binding purpose. The parameter value is passed to the .rdf/procedure through this token. The input (user) parameter value passes to the report / stored procedure after binding with this token. The concurrent program won‟t get impact even the user parameter names get changed, but got impacted when the token name changed. 107) What are the mandatory parameters in concurrent programs? 108)Those are IN or OUT parameters? Responsibility is used for security reason like which Responsibility can do what type of jobs etc. Set of Responsibility is attached with a Request group. When we attach the request group to a concurrent program, that can be perform using all the Responsibilities those are attached with Request group. It is data security functionality in Oracle 10.6 and above. Applicable User responsibilities are created and attached to specific Operating Unit. User can access the data that belongs to the Operating unit they login under. The benefit is it enables multiple operating units to use a single installation of various modules, while keeping transaction data separate and secure by operating unit. 111)There is an Object type “Spawned” in concurrent program. What is the use? 112)How can we call a Report from Form in Apps? 113) what are the setup we need to do before running into Oracle Apps? Switch to COE Dev Sys Administrator (Responsibility) > Add the Responsibility that is attached to the newly created User > menue > exclude / include the function according to the requirement. 115) What is the difference between po_headers & po_headers_all? 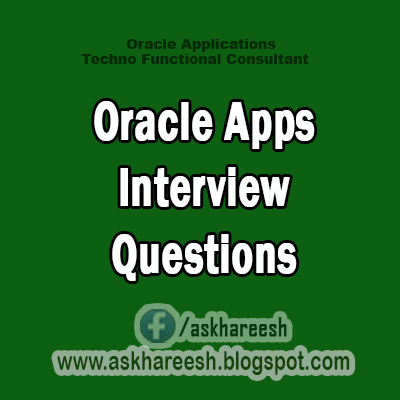 116) What is the basic requirement that we need to set before starting a form in Oracle Apps? 118) What is the API we use to see the message from log file? When we use an API, it automatically stores the error message in a pl/sql table i.e creating a log of the errors. 119)There is a check box called Use in SRS. What is its use? SRS stands for Standard Request Submit. We can execute concurrent program by directly passing parameters. On checking this „Use In SRS‟ check box, we can independently use the concurrent program. 120)Do you know Extension table? Unlike database table, it store outside the database like BFile (content store outside the DB but the location store in DB like pointer). It contains metadata only. So no DML operation (except SELECT, Group by, Order By) can possible.